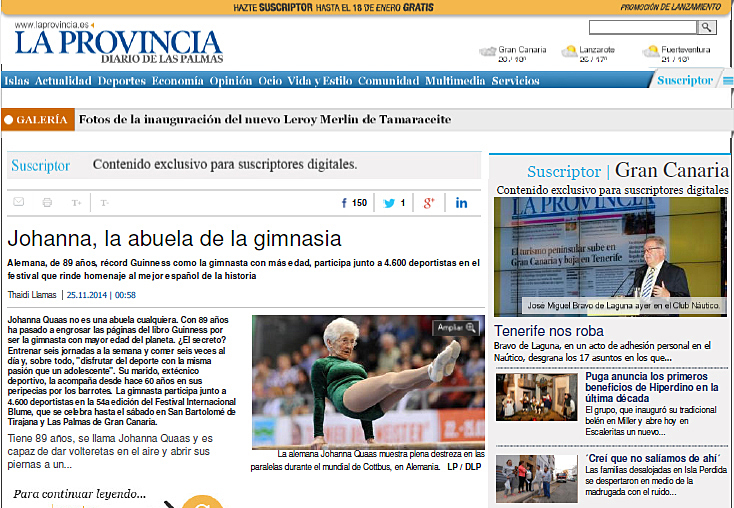 On the second night of the stage shows at the BlumeFestival in Maspalomas, the German Grandmother of gymnastics, Johanna Quaas, flew formally the hearts: Together with the German Hessian "father of gymnastics", senior gymnast and bedrock, Ernst Niesner, she joined the evening show at the commercial "Jumbo center" on - both with her floor routine. Nearly a storm of enthusiasm they showered and there was even a standing ovation, especially for Johanna, namely as the audience heard that she has just celebrated her 89th birthday three days before ...! BLUME-OC chief Jesus Telo Rodriguez was very enthusiastic about the island press coverages one day later: Johanna Quaas from Halle an der Saale offers full-pages next day at the Island's newspapers (* look at ...> La Provincia from Nov 25) and there have been numerous media inquiries for more contacts and interviews with the oldest gymnast of the world! It is just amazed the whole world how powerful a woman with almost ninety years can be! Sometimes Johanna Quaas herself also wonder about it, because for her it is a life-long acquired knowledge that regular sport and in particular the age-appropriate gymnastics operated together to keep the body and mind. Nothing else is also behind the BLUME festival philosophy, which it applies are continually varied to prove it! Ebenso wie die deutsche Altersturnerin überzeugten auch die "Goldenen Ladies" aus Schweden, die schon seit über einem Jahrzehnt zu den Blume-Festival-Stammgästen gehören, mit Anmut, Harmonie und Überzeugungskraft, dass von der Gruppendynamik, die in solchen Vorführungen steckt, alle im Alltag positiv profitieren! Der aktuelle Deutsche Meister der Gruppengymnastk, der "SKC TaBeA" Halle, der am kommenden Samstag seinen Vorjahrestitel im Internationalen Rhythmic Gymnastics Turnier in Las Palmas verteidigen will.